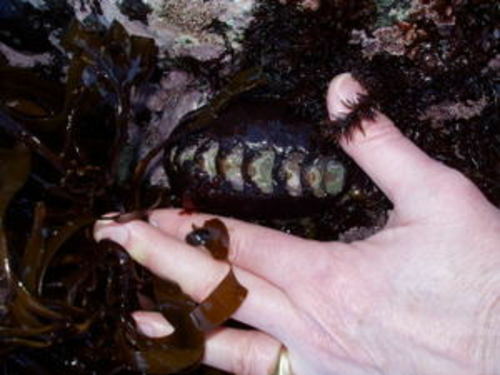 Leather Chitons (also nicknamed Black Katy Chiton) are quite common on the Southern Oregon Coast, and are easily spotted due to their large size...they can grow to almost 5 inches long by the time they are three years old. This chiton has a glossy black leather-like tunic which nearly covers its eight plates...the signature feature of all chitons. 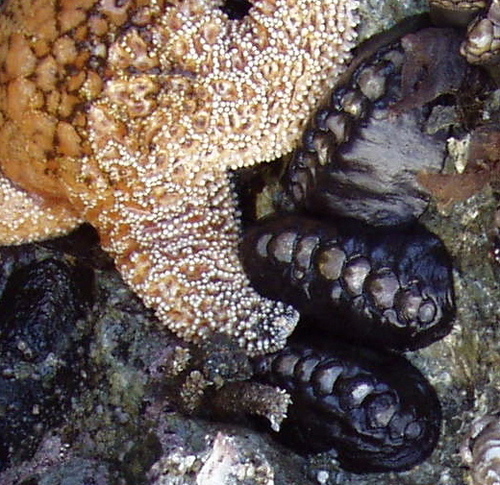 The flexibility of these articulated plates, combined with a relatively large sucking foot, allows the chiton to cling very tightly to rock surfaces, and maintain a foothold in even the roughest surf. 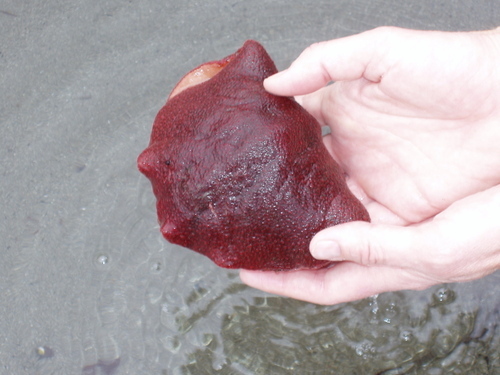 The Gumboot Chiton (Cryptochiton stelleri) is the largest chiton in the world and can grow up to 13" long. It resembles a football in size, shape, color and texture. It doesn't appear to have the signature eight articulated plates of a chiton, but upon closer examination of the photo below, you can distinguish the outline of the plates under the leathery "girdle" that has completely overgrown them. 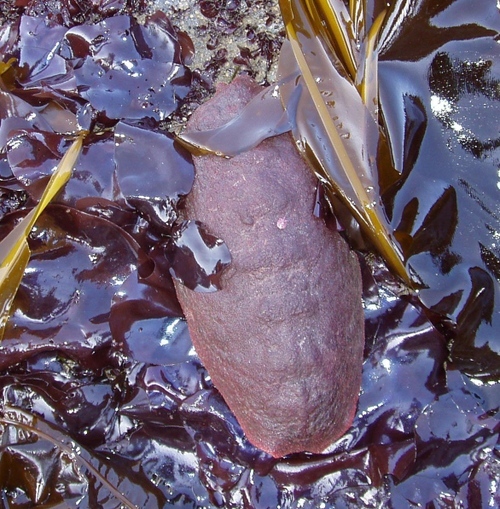 We have found Gumboot chitons in many locations, but they seem to be more plentiful in areas where there is an abundance of kelp. Gumboot Chitons graze on algae, have few enemies, and can live for more than twenty years. The Gumboot I'm holding in the photo below has folded itself in half, on its way to curling into a ball. This defense mechanism of curling its body to protect its vulnerable underside from predators, is used by all chitons and has earned them the nickname "sea cradles". 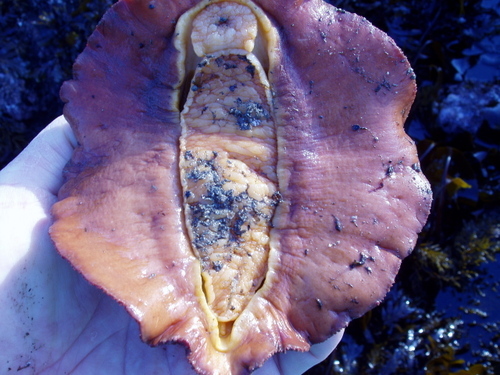 Never pry a Gumboot Chiton off a rock, as you could damage its foot, but if you find one that is not attached, turn it over for closer observation. The foot is the oval shape in the middle (see photo below) and there are gills along each side of the foot (in the photo, the gills are hidden in the narrow opening on either side of the foot). We think the Lined Chiton (Tonicella lineata) is the most beautiful of all the chitons in the tidepools. Happily, they are often found during a low tide on surf-swept rock surfaces covered in coralline algae (the pink algae pictured below, both branching and encrusting). Coralline alage is this chiton's main source of food. 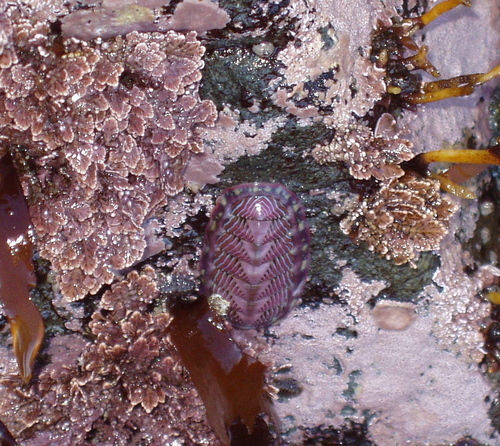 Lined Chitons are only two inches long, and their wide variety of intricate patterns and colors (red, pink, purple, yellow, and white) camouflage them well, so you will have to have a sharp eye to spot them. 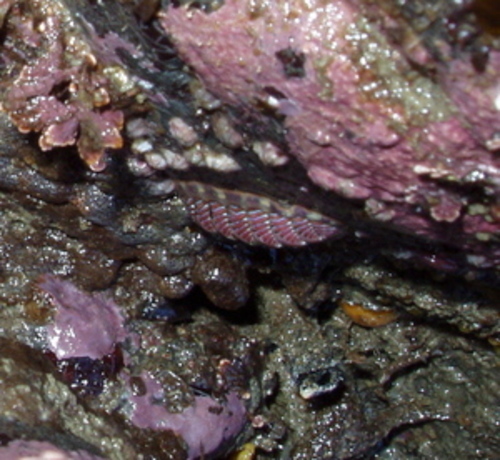 Most Chitons are light-sensitive and are found hiding under ledges (see photo below), rocks, or snuggled into crevices during daylight hours. The Lined Chiton, like the Black Leather Chiton, does not need protection from the sun, and is often found boldly exposed on rock faces. 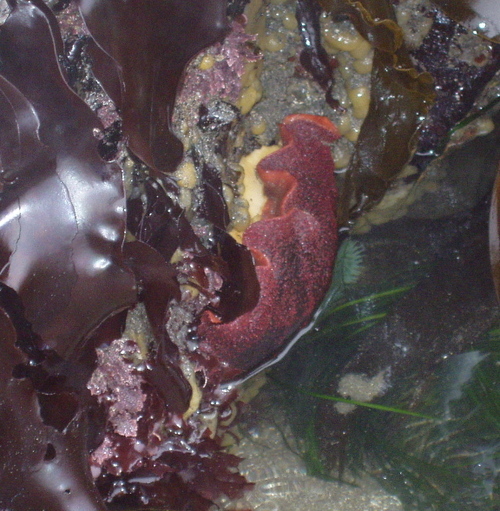 They are often the prey of Ochre Sea Stars.